Smoking is out; vaping is in! E-cigarettes are much smarter, safer and sexier. E-cigarettes are great for women who are 'social' smokers as well as regular smokers who are trying to quit. Read on for the many, many reasons why women are switching to e-cigarettes in droves. Vaping Vamps is the only e-cigarette brand created by women, for women. A heroine is someone who died for a cause. Barb Tarbox (1961 – 2003, age 42) is without a shred of doubt in my mind, a heroine. Like many teenagers, Barb began smoking in high school because she wanted to be "popular." Even though she was beautiful, she still wanted to fit in. While the dangers of smoking were well known when she started smoking in the mid-1970's, plenty of teenagers started smoking to look cool. Barb Tarbox was a beautiful young woman who started smoking an occasional cigarette as a teenager. What amazes me is that teenagers still start smoking for the exact same reasons: because they think it looks cool and they want to fit with the "in" crowd. Anyway, back to Barb. Barb started small, like a lot of "social smokers." She would typically just snitch a cigarettes out of her mother's purse. But nicotine, while not a carcinogen, is very addictive. By the time Barb was 21, she was up to two packs a day and that's when she learned that her mother, a lifelong smoker, had terminal lung cancer. Barb famously reports that the doctor warned her that if she didn’t quit, she would find herself in his office within 20 years. Sure enough, 19 years later, now married to the love of her life and with a young daughter of her own, Barb was diagnosed with Stage IV lung cancer. The cancer quickly spread to her brain and bones, and there was little doctors could do. Diagnosed in September 2002, Barb was told she would be lucky to make it to Christmas. And here comes the heroine part. Most of us would focus on what would make us happiest in our remaining months of life. But not Barb. 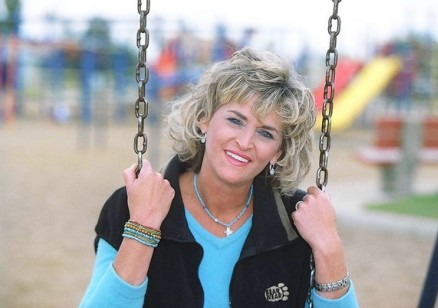 Rather than quietly living out her final days in the company of family and close friends, she decided to spend her last weeks on this earth talking to kids, telling them her message. She told them her story, why she picked up her first cigarette, and that she just wanted to be "cool." She told them she should have quit when her mother died of lung cancer. She told them she couldn't even quit when she was diagnosed with lung cancer. She told them what she would do differently. Her message was simple and to the point. "If you smoke, quit. And if you don’t, never start." Her delivery was frank and open, full of emotion. She didn't hold back. She would even remove her scarf to reveal her bald head. In the months following her diagnosis, Barb spoke to more than 50,000 kids all across Canada, reaching millions more in radio and TV appearances. Teenagers would hand over their packs of cigarettes, vowing never to smoke again. Perhaps her mission kept her alive a little longer, because instead of dying at Christmas, Barb hung on until May 18, 2003. Since she passed away, the teenage smoking rate in Alberta has dropped by about five percent to 13 percent. And her work still isn't done. 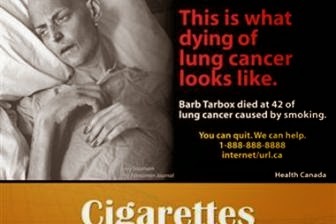 Two photos of Barb in her last days of life now appears on Canadian cigarette packaging, and the government has raised tobacco taxes and penalties for providing tobacco to minors. Photos of Barb in her final days appear on Canadian cigarette packaging. Barb was posthumously awarded the Meritorious Service Medal in 2003 by the Governor General of Canada, for her devotion to the anti-smoking cause. Her daughter, Mackenzie, accepted the decoration and continues to talk about her mother's amazing legacy. Become a Vaping Vamps VIP! The Making of "Vape Inside and Get the Guy"
Vaping Vamps. Simple theme. Powered by Blogger.